Over 100 people have died from hunger in a single region of Somalia in just 48 hours according to Prime Minister Hassan Ali Khaire. These are the first deaths attributed to the country’s severe drought since a “national disaster” was declared earlier this week. Khaire confirmed the deaths in the southwestern Somalia’s Bay region during a meeting with the Somali National Drought Committee on Saturday, according to AP. 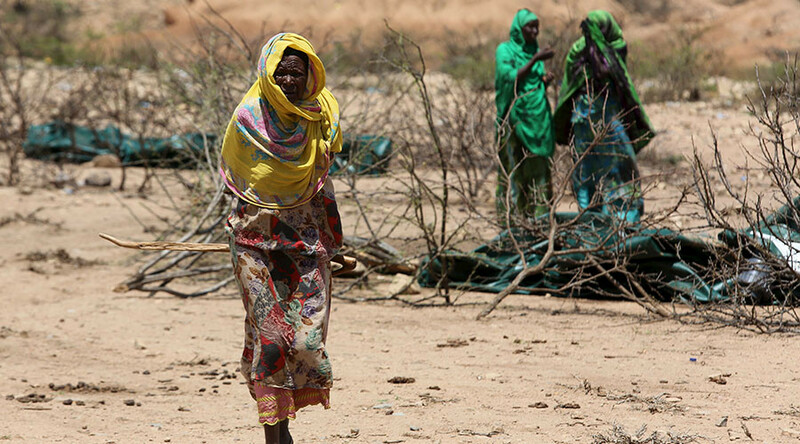 The drought-stricken country is on the brink of famine, with 6.2 million lives at risk, according to humanitarian agencies. Thousands of people have surged into the country’s capital Mogadishu, in search of food, forcing support agencies to speed up their response efforts. Newly-elected Somali President, Mohamed Abdullahi Farmajo, announced a “national disaster” Tuesday, just a week after his inauguration, and urged all stakeholders to “respond more effectively” to the famine threat. The International Organization for Migration has noted the “worrying similarities” between the latest crisis and the 2011 famine which left more than a quarter of a million people dead. Livestock is dying as a result of the drought, and people are struggling to find food and water. UN experts have warned the lack of clean water presents an additional threat, cholera. UNICEF warned last month that nearly 1.4 million children were at risk of dying from famine in Somalia, Nigeria, South Sudan and Yemen. Officials warned that the number of malnourished children in Somalia was on course to leap from 185,000 to 270,000 over the next few months. The UN has also warned that children missing school as a side-effect of the drought, could result in a third of children dropping out of education entirely. U.N. humanitarian coordinator, Stephen O'Brien, is expected to travel to Somalia in the coming days to review the situation and to sketch a humanitarian response.